Butter London is a 3 free company: No formaldehyde, No toluene, No D.B.P colour, No carcinogens. In short, gorgeous nail varnish with no nasties! An array of colours awaits you, it's almost impossible just to pick one. The neutrals are perfect, the shimmering alluring and the matte deliciously dense. 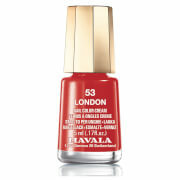 With fun, flamboyant, London inspired names Butter London makes nail lacquer that is just so much fun!